The leading cryptocurrency in 1st generation blockchain is bitcoin. The leading cryptocurrency in 2nd generation blockchain is Ethereum. 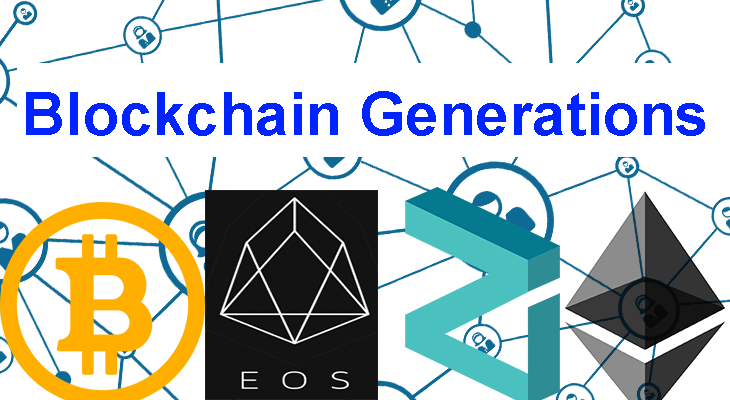 The leading cryptocurrency in 3rd generation blockchain is EOS, Cardano, Zilliqa, Stellar etc. Blockchain Generations: Blockchain technology is going to make the internet more secure and efficient. This article will discuss the blockchain generations over time. We will discuss the 1st blockchain generation, 2nd blockchain generation, and 3rd blockchain generation. We will also discuss the leading companies working in each blockchain generation. The technological revolution just revolutionized the internet over the past few decades. Still, the companies are trying to bring more revolutions to the internet. The web is making its part to the world of internet. We have witnessed some generations over time. The World Wide Web starts its journey back in 1990. When the web consists of static pages. The web of early 1990 is known as Web 1.0. Later on, the work was proceeding and we witnessed a new revolution in the form of dynamic web pages. We witnessed an increase in user interface design and the user interactivity with the web was increase as compared to static pages. The web of dynamic pages is also known as Web 2.0. It has brought more opportunities and e-commerce industry takes growth during this period of time. The work on artificial intelligence and big data is underway. The IoT is making the use of physical devices more efficient via the internet. Now, as the businesses and individuals are adopting the internet, we need a more powerful network to meet the requirements. Yes, we need a technology that has more power and security. The advancement in internet technology put the world on the risk of being hacked by black hat hackers. The blockchain is said to be the 3rd third generation of the web. Blockchain technology was introduced back in 1990 by Stuart Haber and W. Scott Stornetta. But the world didn’t utilize the potential of the blockchain earlier. Different companies are trying to achieve efficiency, reliability, security, and scalability using blockchain technology. As a result of the research from different companies, there are some blockchain generations given below. Satoshi Nakamoto was the first name behind the blockchain technology adoption in the real world. In 2008, Satoshi Nakamoto releases the white paper of bitcoin. The key feature of bitcoin was the underlying blockchain technology. Bitcoin is a decentralized peer to peer network for sending and receiving money around the world. No central authority control the bitcoin. The purpose of bitcoin was to provide the users with a borderless payment network. Bitcoin practically utilizes the blockchain for the first time but failed to meet the requirements of the users. The issue with bitcoins is the low scalability. Currently, bitcoin has a transaction speed of 7 transactions per second that’s very low as compared to the credit card which is 24000 transactions per second. The bitcoin blockchain is based on PoW(Proof of Work) algorithm. In PoW, miners solve the complex mathematical equation to perform bitcoin mining and transactions. PoW is a costly and power consuming process. Supercomputers or ASIC miners are required to complete the transactions. As the more bitcoins are going through the process of mining, the difficulty of mining the bitcoin is increasing. Hence we need the more powerful computer to mine bitcoin. We can say, the process of mining bitcoin is complex, power consuming, and time-consuming. The blockchain of bitcoin is failed to provide the users with efficiency and scalability. As the bitcoin was not able to meet the user’s requirements, there was a need for a more scalable system. Different companies start working on blockchain technology after bitcoin. Ethereum introduced the advanced version of blockchain as compare to bitcoin. Ethereum is an open-source blockchain based on distributed computing platform featuring smart contract functionality. It supports a modified and improved version of the Nakamoto consensus. Ethereum provides the platform for building decentralized applications. The developers can develop the decentralized application. The Ethereum push the development with a huge advancement. We came to the know the real potential of blockchain technologies with the Ethereum platform. Ethereum is also known as the second generation of blockchain as it provides the solution to the scalability issue. Ethereum network can perform 15 transactions per second. The transaction speed is more than bitcoin but still, it is very low to meet the user requirements. The Ethereum also introduce the concept of PoS(Proof of Stack). The PoS is low cost and more efficient as compared to PoW (Proof of Work). Despite lots of development in the Ethereum platform, users are still having the issue with scalability. Here, the second blockchain generation is almost failed to provide the users with scalability and other factors. The next blockchain generation (3rd Generation Blockchain) has the ability to resolve the issue as the new innovation in blockchain technology is going to make the blockchain more scalable. There are many other applications of blockchain technology available in the market with the emergence of 3rd Generation blockchain. As I have mentioned above, there are different companies trying to be the third blockchain generation. We will discuss the companies with innovative technology in the blockchain sector. There are many other companies trying to resolve the issue with the first two generations of the blockchain. The top companies besides Cardano, Stellar, Zilliqa, and EOS, you will find many more as the competition is really tough. The Cardano is claiming to be the 3rd generation of the blockchain by resolving the issues with scalability and interoperability. Cardano is a decentralized public blockchain and cryptocurrency project that is the completely open source. Cardano is developing a smart contract platform designed to provide more advanced features than any protocol previously developed. But also, Zilliqa is claiming to have a system capable of 2828 transactions per second. The company is trying to get a transaction speed of 10,000 TPS. At the same time, EOS and other companies are trying to achieve a high throughput and more scalable blockchain. Let’s see who will lead the market. The future of blockchain is really promising as many companies are joining the network. We need a blockchain that has the ability to resolve the issues with existing blockchain. The world has realized the importance of blockchain. That’s the reason the IoT, big data, artificial intelligence, and e-commerce companies are working to develop a secure and scalable blockchain. Maybe we will witness the next blockchain generation in coming years. Maybe 4th generation blockchain or 5th generation blockchain will provide that required scalability. We have to wait as the blockchain technology is still in its initial phase. We know the internet was just a network of static pages and with time the innovation in internet technology revolutionized it. Similarly, the blockchain technology is going to revolutionize the world. The world is heading toward 4th Generation blockchain. Blockchain 4.0 is using MPOS(Multiple Proof of Stack) algorithms. In MPOS, multiple users involved in mining instead of a single user. You become part of the network and start mining by following simple steps. Everyone can be part of the mining process. Meta hash is one of the leading projects claiming to be the blockchain 4.0. Meta hash is providing the fast, secure, and decentralized platform for building dapps. It will also help in sharing digital assets.